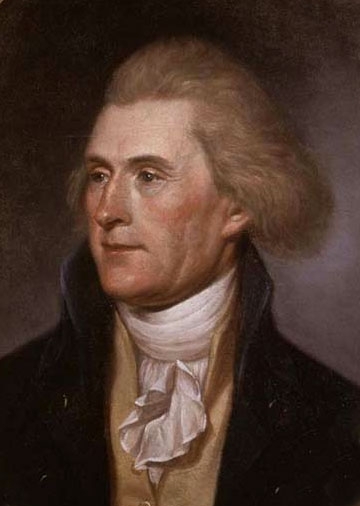 Thomas Jefferson was the primary author of the Declaration of Independence. Drafted by Thomas Jefferson, and edited by luminaries such as Benjamin Franklin and John Adams, the Declaration of Independence was adopted by the Second Continental Congress on July 4, 1776. Over 200 years later, it remains one of the more seminal political documents ever penned. The Declaration consists of three major parts. The preamble employs the enlightened reasoning of Locke, Rousseau and Paine, to establish a philosophical justification for a split with Great Britain. The main body lists numerous grievances and examples of crimes of the King against the people of the colonies, making him “unfit to be the ruler of a free people.” This section also challenges the legitimacy of legislation enacted by Parliament and chastises the people of England for remaining “deaf to the voice of justice and of consanguinity.” In the conclusion, the climax of the document, Congress announces to the world that “the good People of these Colonies, solemnly publish and declare, That these United Colonies are, and of Right ought to be Free and Independent States.” On the morning of July 5, Congress sent copies of the Declaration of Independence to various assemblies, conventions, and committees of safety, as well as to the commanders of Continental troops. The die had been cast. Ideals presented in the preamble remained to be earned on the battlefield, but the seeds of a new nation founded upon unalienable rights and the consent of the governed were sown in the Declaration of Independence.